“Was there a pang of remorse for his actions in his mind? Possibly, but what choice did he have? If he wanted to survive, he had no room for weakness. In prison, he has acquired a drug habit, which is killing him slowly and his only chance of survival is a very expensive renewal process, which will make him young again and cure his drug habit. After ten years in jail, he is suddenly given a reprieve and offered a chance to redeem himself. 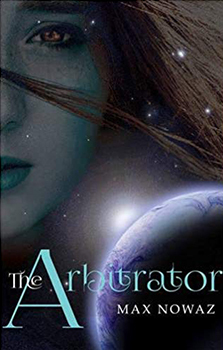 He is sent as the ‘Arbitrator’ to ‘Pirrus’ in another solar system, to try and stop a rebellion and bring matters under control. Will he complete the mission successfully to earn enough funds for his regeneration? Only time will tell. Just when he thinks he has accomplished his task, he meets Gina, the daughter of a rebel, and finds out that there is a plot by foreign powers to invade the planet… The plot thickens when Brown also discovers that there is a mole in his organisation who is undermining his efforts to succeed. How will Brown react to the devastating news? This book will appeal to fans of innovative science fiction and people who enjoyed the stories in The Avatar and The Blade Runner.